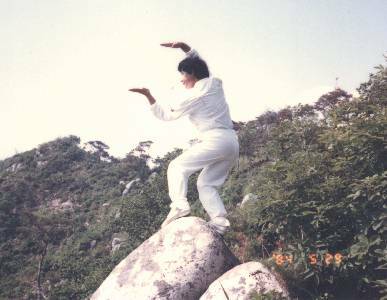 Grand Master "Iron" Kim demonstrates Kum Gung Quan movement. Through the practice of this form, one can achieve tremendous internal as well as external benefits. Grand Master "Iron" Kim began his martial arts training at the age of seven. To achieve perfection of his martial arts movements, Grand Master "Iron" Kim many times chose the solitude of the mountains and ocean areas of Asia to practice the forms and techniques that he learned. Although he learned from many qualified teachers, a majority of the knowledge that Grand Master "Iron" Kim possesses was passed down through Wang Po, the 7th generation Grand Master of Yin Yang Doe. In 1956, Grand Master "Iron" Kim did compete in, and win, the All Asia Championship that was sponsored by Wang Po and was held in the Cho Leung area of Pusan. The Chinese title of Chung Moo Jik, or "Champion", was bestowed upon Grand Master "Iron" Kim. The first place award that he did receive was called a Chung Moon Chung. A Chung Moon Chung is a paper scroll with the accomplishments of the winner and carries the official seal of the tournament. Several prominent judges and martial artists were in attendance at this championship and they hold in the memory their truth of this occasion. The presiding judges were Pang Chou Fai ( then a resident of Taegu), Wang Sei Kau (then a resident of Pusan), and Hwan Byung Quan (then a resident of Pusan). These three judges were originally residents of China. Also in attendance were Mok Jing Quan, Chae Jung Su, Park Hyun Su, Yu Gee Han, Chil Sung and Park Yung-Gil. After winning the All Asia Championship, Grand Master "Iron" Kim continued to excel in martial arts form and movement. He was teaching others and in fact sponsored many of the Chun Dong Yang Moo Sul Yun Moo Dae Hwe championships. The strength that Grand Master "Iron" Kim demonstrated at these tournaments convinced other practitioners to decline to challenge him in the years that he sponsored the tournament. Because he was uncontested champion during that time, Grand Master "Iron" Kim was bestowed the honorable title of Chon Shim Pan Whey Won Chaeng, or "Supreme Judge and Arbiter" by the co-sponsors and the martial arts experts who participated in these tournaments. Even though Grand Master "Iron" Kim did earn the title of uncontested Champion of All Asia, he felt that there was much still to learn and thus he continued to study and develop his skills further. His ultimate hope was that all martial arts could some day be united. 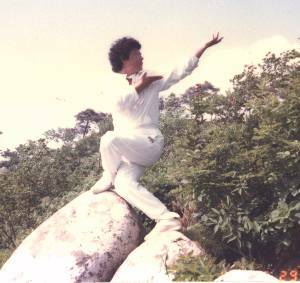 Grand Master "Iron" Kim demonstrating movements near the mountain area where he practiced in his youth. In the early 1960's, Grand Master "Iron" Kim expanded his quest for knowledge. He traveled and sought Masters who had reached a higher level of Moo Doe knowledge. There were seven top practitioners from an elite group of about twenty Masters throughout East Asia with whom Grand Master "Iron" Kim exchanged individual skills in the martial arts. Grand Master "Iron" Kim's purpose was to build his own wisdom, knowledge and understanding in the Moo Doe traditions of the eight main styles. The majority of the knowledge that Grand Master "Iron" Kim possesses was passed down from Grand Master Wang Po, and includes Bagwa Chung, Ship Pal Gye (18 Weapons), Goong Bu (Kung Fu) and Tai Chi Chung. Che Jung Su, Yu Gee Han, Park Hyun Su and Yi Jung Gyu shared their knowledge of Judo, Udo, Jui Jitsu, Hapkido and Aikido with Grand Master "Iron" Kim. Kim Hong Man, Sung Baek Yu, Park Yun Su and Mok Jing Quan shared their knowledge of Kong Su Doe and Kom Doe with Grand Master "Iron" Kim. Many higher Moo Doe practitioners familiar with martial arts in East Asia during the 50's, 60's and 70's should be able to recognize the skills and abilities of many of the individuals named in this brief history. Grand Master "Iron" Kim's goal was to teach the Chung Moo line to people of all nations, and to do that, he decided to build a strong foundation of martial arts in the United States from which to spread worldwide. 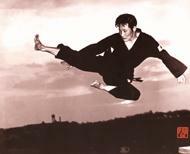 With this goal in mind Grand Master "Iron" Kim left the Orient and came to the United States in the early 1970's. Upon arriving in the United States, Grand Master "Iron" Kim felt he could best begin to teach martial arts by first learning basic English and American culture. Between 1973 and 1979, after educating himself about the American way of life, Grand Master "Iron" Kim opened the first of four schools that he has owned in the United States. 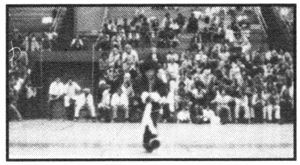 Many times in areas where schools became established, the local paper would interview Grand Master "Iron" Kim and write articles about him and the Chung Moo style of martial arts. During the "Billy Jack" movie promotion in California, Grand Master "Iron" Kim demonstrates sword form. During the "Billy Jack" movie promotion in California, Grand Master "Iron" Kim demonstrates concentration, using 1/2-ton pressure to break a brick on an instructors head without injury. 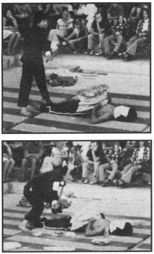 To popularize and promote martial arts in the United States, Grand Master "Iron" Kim demonstrated the Oom Yung Doe style at many charitable fund raising martial arts demonstrations. One such martial arts promotion preceded the release of the movie "Billy Jack". Hundreds of renown martial arts experts and Masters from around the world and many movie stars were in attendance. In 1975 Grand Master "Iron" Kim briefly returned to Korea. It was at this time that Wang Po the 7th generation Grand Master of Yin Yang Doe, passed to Grand Master "Iron" Kim all the knowledge and traditions that had been passed to him. Soon thereafter, the title of 8th generation Master of the Chung Moo line was bestowed upon Grand Master "Iron" Kim. Grand Master Wang Po passed away in 1976 in Pusan at the age of 93. From 1973 to 1979, Grand Master "Iron" Kim personally taught thousands of upstanding members of our communities, including honorable members of the clergy, federal law enforcement agents, police officers and administrators, federal, state and local officials, distinguished judges, university presidents and professors, armed forces officers, members of the AMA and ABA associations, journalists and many other professionals. Since 1979 Grand Master "Iron" Kim has primarily taught only the utmost qualified high ranking instructors. Thousands of individuals and practitioners of Oom Yung Doe martial arts in the United States who have personally witnessed demonstrations of Grand Master "Iron" Kim's movements, will attest to his extraordinary strength and ability.